Flathead catfish are just like many other catfish appreciated food and sports fish however Flathead Catfish also has a special place in the heart of a large number of aquarists that like to keep these fishes in their aquariums. Granted they might not be as common as many other aquarium fish but what can you expect for a fish that grows to be 155 cm / 5ft long and to a weight of 56 kg / 124 lb. Needless to say, the group of aquarist fortunate enough to be able to house these huge catfish as well as other huge catfish species are few. But if you are one of the fortunate few you’ll find that the Flathead Catfish is a interesting and beautiful fish. Flathead Catfish is a to the US native species that today is found in most parts of the US after being introduced to a lot of different waters across the nation due to it’s value as a game and food fish. They can be found in slow moving water in large rivers and streams but can also be found in lakes. They prefer deep water with fallen logs and other hiding places. Flathead catfish are unlike many of the other catfishes found in the US solitary. If kept in aquarium they need an aquarium that are sufficiently large and that is decorated with hiding places among large roots and bogwood. A few stones can also be used to create hiding places. Flathead catfish grows very fast which should be taken into consideration when deciding if you have enough from to house one. Only keep one adult flathead Catfish in the same aquarium or pond unless it is extremely large. They should only be kept with other fish that are to large to be eaten by the Flathead catfish. Make sure that the aquarium is well filtered since these large fishes eats a lot which puts a lot of stress on the water quality. Flathead catfish are best kept in water with pH 6-8 and with a water temperature of around 77-82°F / 25-28°C. Flathead catfish are like many other catfish species easy to feed in captivity and can learn to accept a variety of dead food. (Many times they willingly accept food of this type without training) Their main diet in the wild is other fish and catfish. Their diet also includes frogs, crayfish and young birds. Flathead Catfish - Pylodictis olivaris. Flatheads are close to impossible to breed in aquariums due to their solitary nature but they can be breed in large ponds. In the wild Flathead catfish spawns during the late spring when the water temperature is raising. The male guards the egg and fry in a nest that usually is placed in a cave or near another sunken object that can help provide cover for the nest. The female can lay 100 000 eggs in one spawning. The fry form large schools in and around the nest the first few days but after that they disburse and the males parental duty is then over. 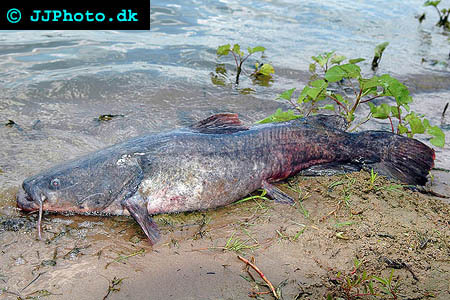 Flathead catfish can sometimes crossbreed with Channel Catfish. The maximum age of a flathead catfish is unknown but an educated guess based on their max size and other related catfishes would suggest that an age of 40-50 years is within their grasp.